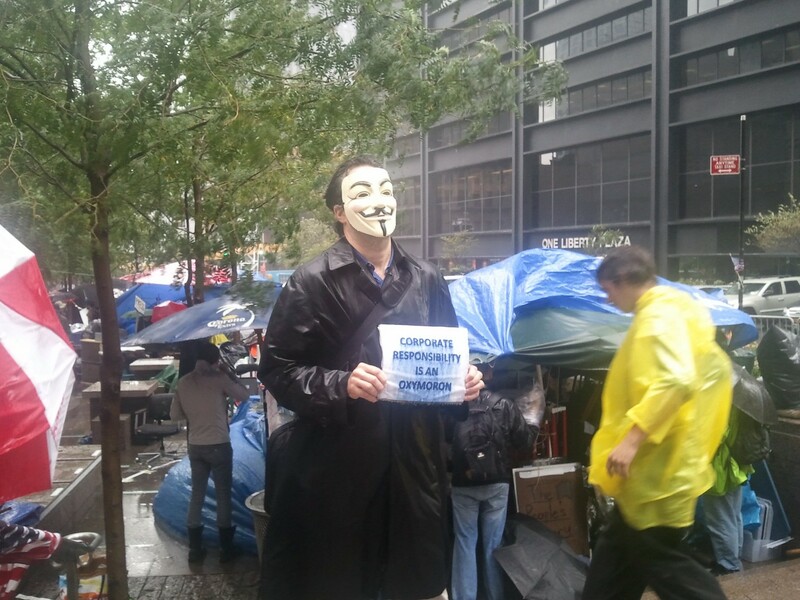 Zuccotti Park and Me | This is Water. This is Water. 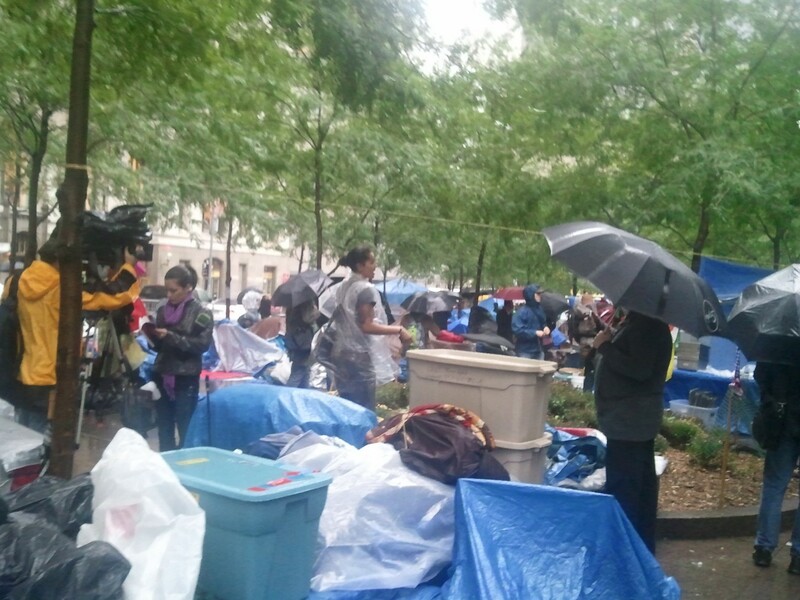 So I’m back in my hometown for reasons I’d rather not get into but while here I decided to go down to Zuccotti park and witness history. Of course the day I choose was rainy and dark and cold but hell that’s been the theme of my week anyway. So for one Zuccotti park is about a block from Wall st. which is in and of itself a few blocks from the actual Stock exchange. The park (well only in NYC would this be considered a park) takes up a space of one city block. There were around 50-60 protesters present and some press (though mostly obscure local paper type press). Food was being handed out ala soup kitchen style but the fare looked decidedly better. The NYPD was keeping a respectful yet watchful distance. The time I showed up was around 1 pm so there was not much actually going on. Maybe it was the reason that bought me to NYC to begin with but being down there felt oddly uplifting as if there was something really honest and pure and college age idealism-like down there in that park on a rainy dark day. And hell I’ll take uplift wherever I can get it right now. The kind of uplift that brings people together for whatever reason- to fight against real and perceived evil. To slack off.To voice real pain and rage and powerlessness. To commune with others. To rant. To rave.To call in sick. From work. From life. To express a nascent feeling not on canvas or the printed page but on a single block populated by humans together. And it really doesn’t matter what that feeling is just that it is felt and shared. 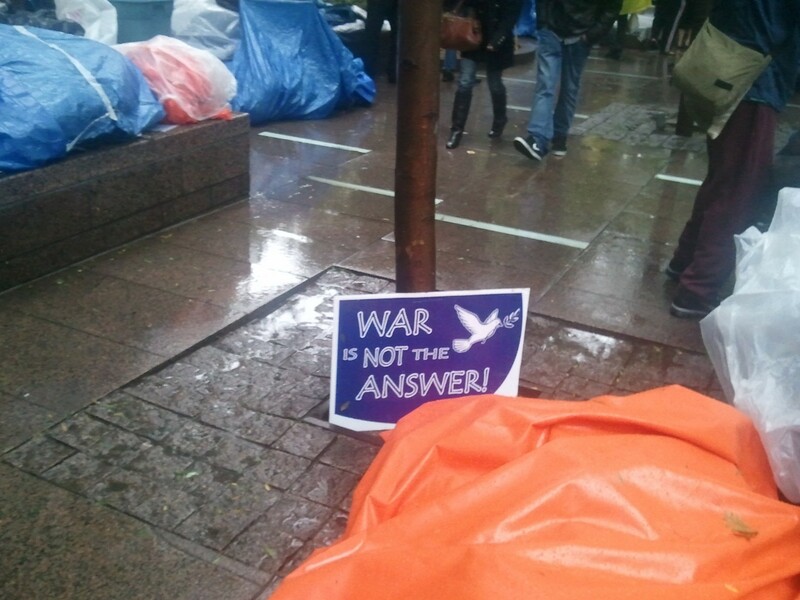 This is what I found in Zuccotti park today. ← An Alternate Musical History of the Last 15 Years or a NME Rebuttal.